When your only food source also contains a deadly poison, your options are pretty limited: either find a new food source or find some way of making the poison less toxic. This is exactly the situation that many plant-eating insects find themselves in, particularly those that eat milkweed. Milkweeds produce a class of chemical toxins named cardenolides. These compounds specifically bind and inhibit the sodium potassium pumps found in heart muscle cells. Without working pumps sodium levels in the cell rise, setting off a chain of events that ultimately disrupt muscle contraction in cardiac tissue. At a high enough dose, these heart-stimulating effects can be lethal to insects, humans and animals in between. How then do insects that depend on milkweed as their main food source cope with this hidden poison? Five different groups of milkweed-eating insects independently arrived at the same solution: mutate specific parts of their sodium potassium pumps so that the cardenolides cannot attach to them as well. For a long time, biologists thought that this was just another example of insects evolving an adaptation in response to a plant’s defense mechanisms. But it’s not that simple. Some insects like the monarch butterfly actually co-opt milkweed cardenolides as part of their own defense against predators by storing the compounds. 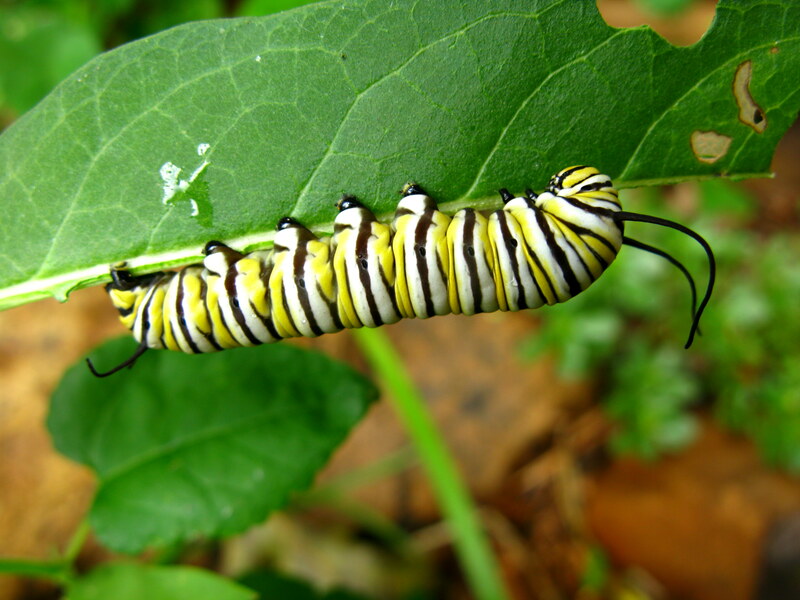 Monarch butterfly caterpillars feed exclusively on milkweed and accumulate cardenolides in their body tissues that are later transferred to its butterfly body for protection against birds and animals that prey on it. While biologists have long known about the ability of some insects to tolerate a toxic cardenolide-containing diet and sequester the compounds as a defense mechanism, the relative importance of these two traits in shaping the insects’ evolutionary response is less clear. Cornell University biologist Dr. Anurag Agrawal and his graduate student Georg Petschenka set out to answer that question by using three different species of butterflies that have slightly different sodium potassium pumps. 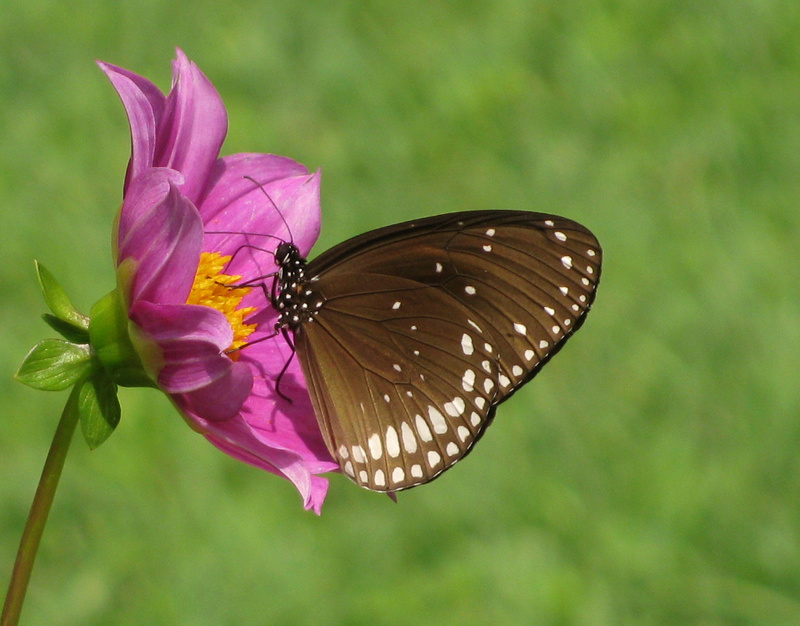 The common crow butterfly has a sodium potassium pump that is highly sensitive to inhibition by cardenolides whereas the monarch butterfly has a highly resistant sodium potassium pump. The sodium potassium pump of the queen butterfly has an intermediate level of resistance. Based on these differences, the researchers predicted that common crow caterpillars would grow poorly on milkweeds compared to monarch butterfly caterpillars. Surprisingly, caterpillars of all three butterflies grew equally well on milkweed, even on milkweeds with the highest levels of cardenolides. Although the researchers didn’t observe any differences in growth between the caterpillars, they did see differences in the amount of cardenolides stored in caterpillar blood. Common crow caterpillars with highly sensitive sodium potassium pumps had no detectable cardenolides in their blood. In contrast, queen and monarch caterpillars had substantial amounts of cardenolides in their blood, with monarch caterpillars having the most. The researchers further showed that cardenolides are initially stored in the gut of the caterpillars, from which point it disperses throughout the body via the blood. What’s more, when the researchers injected the cardenolide ouabain directly into the caterpillars, there was a dramatic difference in how the caterpillars responded. Common crow caterpillars became paralyzed after ouabain injection, with only 23% of paralyzed caterpillars recovering by the next day. On the other hand, ouabain injection had no effect on monarch caterpillars, presumably because their sodium potassium pumps had mutations that rendered them resistant to the actions of ouabain. So what does this all mean? Based on their data, the researchers concluded that in milkweed-eating butterflies, cardenolide-resistant sodium potassium pumps did not evolve as a way to withstand a milkweed diet replete with cardenolide poisons, but rather as a way to deal with the toxic burden of storing cardenolides as a predator defense. While these findings certainly challenge the longstanding belief that cardenolide resistance evolved primarily as a response to dietary restrictions, it’s not clear whether this model holds true for other milkweed-eating insects. For example, arctiid moths have cardenolide-sensitive sodium potassium pumps but they also store cardenolides. It will be interesting to see how these insects are able to cope with toxin buildup. But in the meantime, please enjoy this video of Drake explaining how sodium potassium pumps work.